Charles Helm was born in Cape Town, South Africa in1957. He graduated with M.B.Ch.B. at the University of Cape Town in 1981. He moved to Canada in 1986, settled in Tumbler Ridge in northeastern British Columbia in 1992, has practiced there since then as a family physician, is the Chief of Medical Staff, is on the teaching faculty of the University of British Columbia, and is a Fellow of the College of Family Physicians of Canada. He has applied the palaeontological knowledge he acquired in Canada to his native South Africa since 2007, documenting the wealth of fossil trackways he has discovered along a 350 km stretch of coastline, and has led research publications on these findings. Perhaps the most important discovery was of the largest and best preserved archive of Late Pleistocene hominin tracks yet reported. This work in southern Africa led to him accepting a Research Associate position with the African Centre for Coastal Palaeoscience at Nelson Mandela University, South Africa. He has helped to pioneer the emerging discipline of geomythology in southern Africa. 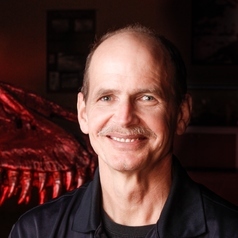 He has given numerous talks on palaeontology, ichnology and geomythology to audiences in Canada and South Africa. Helm, C.W., Anderson, R.J., Buckley, L.G., Cawthra, H.C., De Vynck, J.C. 2017. Biofilm enables identification of avian trackways in Late Pleistocene coastal aeolianites, South Africa. Palaeontologia Africana, 52:78–84. Helm, C.W., McCrea, R.T., Cawthra, H.C., Thesen, G.H.H., Mwankunda, J.M. 2018. Late Pleistocene trace fossils in the Goukamma Nature Reserve, Cape south coast, South Africa. Palaeontologia africana, 52, 89–101. Helm, C.W., McCrea, R.T., Cawthra, H.C., Cowling, R.M., Lockley, M.G., Marean, C.W., Thesen, G.H.H., Pigeon, T., Hattingh, S. 2018. A new Pleistocene hominin tracksite from the Cape south coast, South Africa. Scientific Reports. Online at: www.nature.com/articles/s41598-018-22059-5 (accessed 01 March 2018). Helm, C.W., Cawthra, H.C., De Vynck, J.C., Lockley, M.G., Mccrea, R.T., Venter, J. The Pleistocene fauna of the Cape south coast revealed through ichnology at two localities. South African Journal of Science. Helm. C.W., Klenke, P. On the Measurement of the Earth – New Approaches to our Planet’s Distinctive Shape. Cartographica. McCrea, R.T., Buckley, L.G., Currie, P.J., Plint, A.G., Helm, C.W., Haggart, J.W. 2013. A review of vertebrate track-bearing formations from the Mesozoic and earliest Cenozoic of western Canada with a description of a new theropod ichnospecies and reassignment of an avian ichnogenus. In Lockley, M.G. and S. Lucas (eds. ), Tracking dinosaurs and other tetrapods in western North America. New Mexico Museum of Natural History Bulletin. McCrea, R.T., Tanke, D.H., Buckley, L.G., Lockley, M.G., Farlow, J.O., Xing, L., Matthews, N.A., Helm, C.W., Pemberton, G., Breithaupt, B.H. 2015 Vertebrate Ichnopathology: Pathologies Inferred from Dinosaur Tracks and Trackways from the Mesozoic. Ichnos, 22:3-4, 235-260. In addition he has authored 36 peer-reviewed publications in Canadian Journal of Rural Medicine (available on request). -	In 2013 a newly described genus of fossil marine reptile, Gulosaurus, was assigned the species name helmi in recognition of his contributions to the discovery and study of Triassic fish and reptile fossils. -	Best Speaker Award, 2nd International Conference on Continental Ichnology, Nuy, South Africa (2017). He has also received awards for postgraduate teaching from the University of British Columbia Department of Family Practice, the Walter Smith Visionary Award in recognition of contribution to tourism innovation in northern British Columbia, the Governor General’s Caring Canadian Award (2016), the Queen’s Golden Jubilee Medal (2002), the Queen’s Diamond Jubilee Medal (2012), and the Rural Family Physician of the Year Award (2016) from the British Columbia College of Family Physicians.